The YAKKAir HP and Nomad HP are light weight and high performance inflatable kayaks with the advantage of pack-down and storage into a compact carry bag. 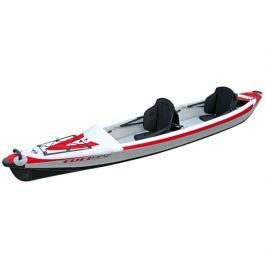 The YAKKAir HP range is a true revolution in inflatable kayaks with the combination of a keel and a high-pressure inflatable hull/floor to maximise the V shape and with it the kayak’s overall performance. The Nomad HP benefits from a higher bow section, extended length, and a flexible decking system giving better internal protection. 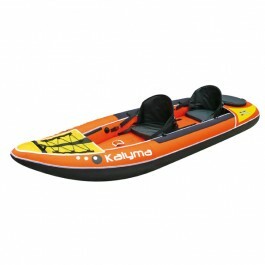 The Kalyma is a family fun kayak for beach, open sea and rivers. Comfortable, tough, aesthetically pleasing, stable and light, it combines an innovative shape with very practical fittings and features : removable seats that are also adjustable for leg length and fitted with storage pockets ; integral water resistant storage compartment, an integrated draining valve… The safety features include three independent inflatable sections, a removable rear fin and a guiding skeg. It can be used for 1 or 2 persons paddling in comfort. It comes with a carry bag, air pressure gauge and a repair kit. YAKKAir Full HPs come with quality fittings as standard : comfortable, ergonomic seats with high back rests to give proper back support. Strap-mounted, adjustable foot rests are the other vital element for maximum paddle comfort on your longest excursions. YAKKAir Full HPs come with the following accessories : carry bag, high-pressure pump with pressure gauge, 1 repair kit, removable fin, 1 or 2 seats, 1 or 2 foot rests (depending on model purchased). The Nomad uses the same concept that was such a success on the YAKKAir HP1 and 2, with a high pressure inflatable keel and bottom section of the hull, together creating a dynamic and high performance hull shape, all at a feather weight and giving an excellent paddle position. As for performance, the Nomad improves in having a higher bow section, its extended length, and a flexible decking system giving better internal protection and enabling even longer trips and excursions. 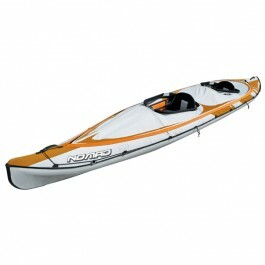 With its decking system, the Nomad HP3 is ideal for longer double paddling excursions, having large space for equipment. It also makes it more viable for the more challenging conditions you find in the cooler seasons. Take out the decking and the HP3 becomes a vast, stable, top-performing family 3-seater. Brand new for 2013 is the Nomad HP1, a solo kayak that follows the same concept as the HP3 (higher bow section, flexible decking…) and of course gives you the same paddle-comfort and protection for your extended solo trips. The guiding principle of these innovative boats has been the use of multiple materials in the construction to help reduce weight, plus the combination of a keel and a high-pressure inflatable hull/floor to maximise the V effect. Result : the YakkAir HP series are lighter, perform better and give a more comfortable ride than conventional inflatable kayaks. They have reduced wind drag/resistance and are easier to steer at sea, giving them a performance equal to that of existing rigid designs. 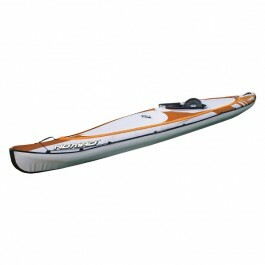 YakkAir HP kayaks are perfect for your seaside holidays. 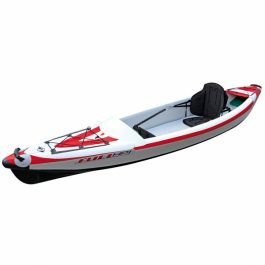 On the water, YakkAir HP kayaks are simple to steer and deliver excellent performance thanks to the dynamic hull design. Contrary to most inflatable models, you’ll be paddling in the dry thanks to the rigid high-pressure floor and the water run offs in the double floor. And paddle comfort has also been improved with the use of a belt backrest as standard. 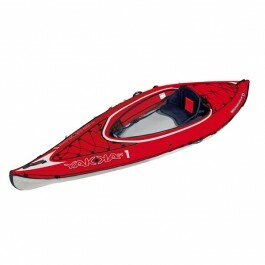 Its smooth glide and excellent sea handling mean you can get away from the shore and go exploring in complete safety. Folded down into a carry bag, the YAKKAir HP is easy to carry on foot or in the boot of your car, and is fully inflated for use in minutes using a high pressure pump with a pressure gauge. The YAKKAir HP 1 is designed for one person use. Stable, fast, light weight and super comfortable, it’s a fully-equipped kayak with a comfortable seat and foot stretchers coming as standard. 1 x Backrest – Footrests – Safety grab lines – Abrasion protector – Bow protector – Carry handles – Accessories’ stowing mesh front & rear – Paddle attachment – Carry bag – Pump – Repair kit. The guiding principle of these innovative boats has been the use of multiple materials in the construction to help reduce weight, plus the combination of a keel and a high-pressure inflatable hull/floor to maximise the V effect. Result : the YakkAir HP series are lighter, perform better and give a more comfortable ride than conventional inflatable kayaks. They have reduced wind drag/resistance and are easier to steer at sea, giving them a performance equal to that of existing rigid designs. YakkAir HP kayaks are perfect for your seaside holidays. 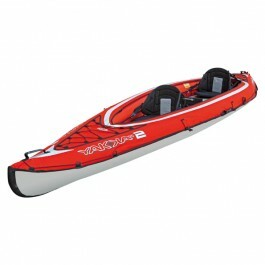 The YAKKAir HP2 has been designed for two-person paddling, but can easily be used solo by only mounting one of the seat / stretcher units in the centre of the kayak, where the appropriate fittings have been incorporated in the design.